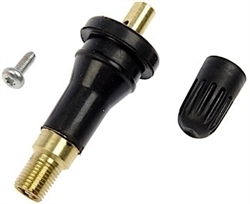 Snap-in sensors can look like regular rubber valve stems. But, the molded rubber on the snap-in valve stem does not reach the threads and there is a tapered shoulder. These valves have a longer cap than a non-TPMS valve stem.